I am so pleased to share this birthday party with everyone! 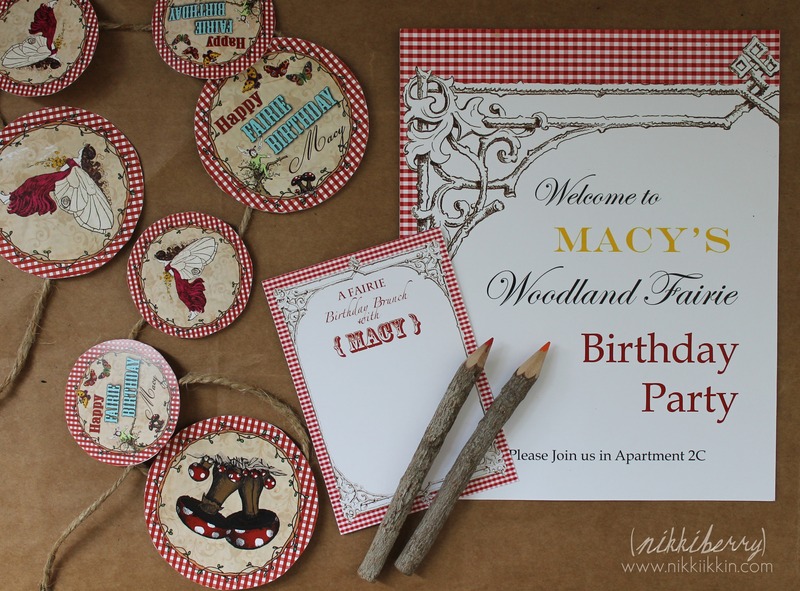 Macy’s 9th birthday was a Woodland Fairie theme. 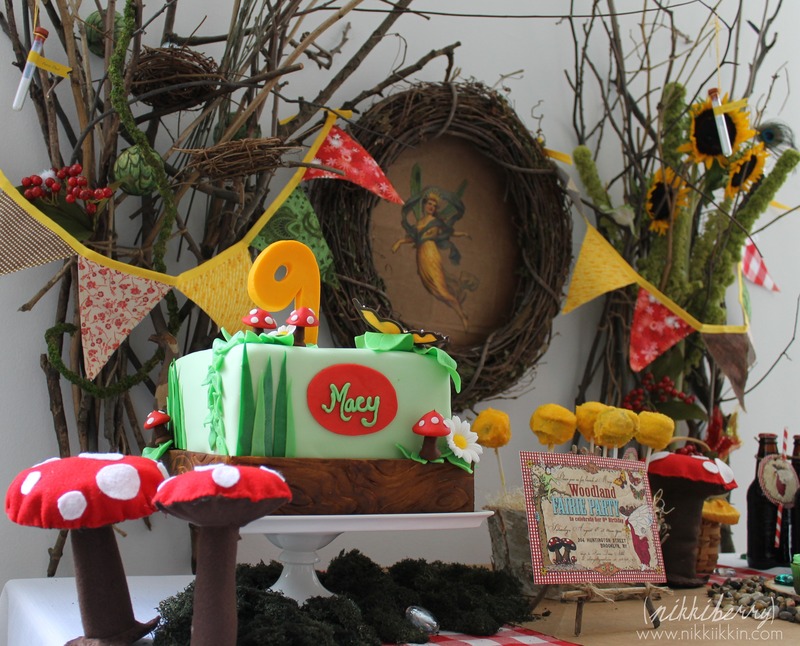 I think that you will find it an inspiration for a Woodland Party theme for a boy or girl. In the previous 8 years of Macy’s birthday parties I had not done a fairy theme and I wanted to get one last little girl party in before they all became Hollywood Glamour and Spa Day parties. My vision was inspired by our favorite cafe and I felt that this type of fairy theme was more appropriate for a 9 year old girl than the tutu and wings type. As always my children’s parties are a big production in our home, we begin planing sometimes months in advance and I design and make nearly everything myself. I hope you find an inspiring idea for your next party in this post. After the party theme was approved by the birthday girl, I started with searching for the invitation that would set the style. I usually make them myself but when I discovered the perfect invitation by B. Nute productions, I was very glad to let someone else take care of it for me. I was interested in a invitation that was a more graphically lavish than what I can create and her whimsical and vintage style was exactly what I had in mind to set the tone for the party design, you can see her site and with many other beautiful designs here. This Woodland Cake is an original that I designed and created. The bottom layer is a dummy cake covered in fondant, carved and hand painted to look faux bois. It turned out fantastic! Painting fondant is super easy, just the color gels and lemon extract is needed. I enjoyed rendering in watercolor in design school and found painting the fondant to be a lot like that. In fact I enjoyed painting this dummy cake so much that I think I’m going to do a little bit of real watercolor soon! The top cake is chocolate (macy said to represent earth!) and has a white chocolate ganache layer before I added fondant. I started doing ganache under my fondant cakes last year and I love everyone of them! It gives the cake a more solid surface to except the fondant and Ive found it easy to build up any uneven sides or corners in the ganche. I achieve an almost flawless fondant covering every time! 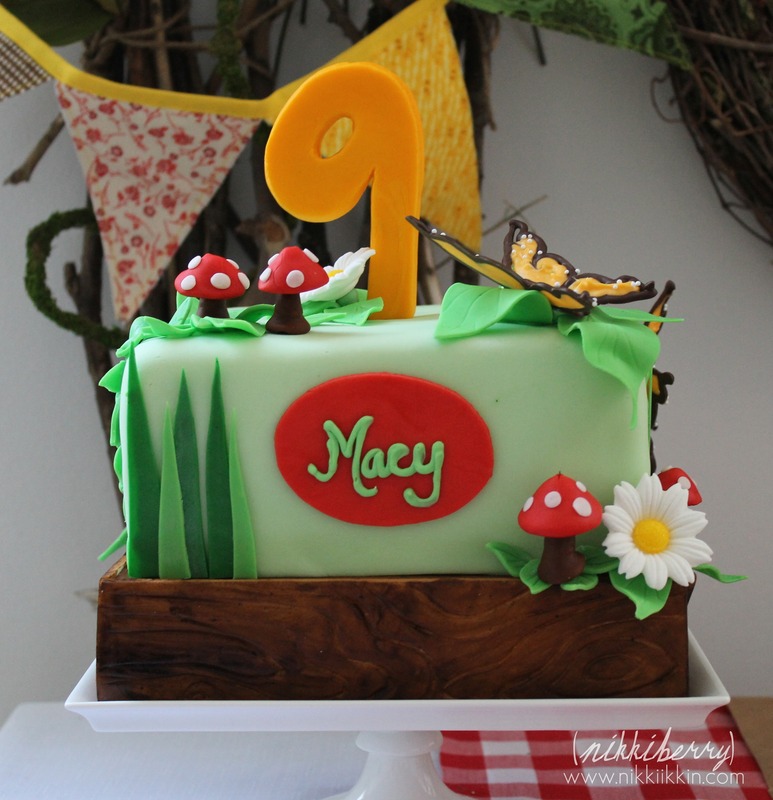 The number 9, toadstools and grass are fondant, the flowers are purchased from my favorite cake supplies store NY Cake on 22nd street in the flat iron district and the butterflies are hand piped chocolate from this tutorial from http://www.chefmommy-brandao.blogspot.com. There were a few other support areas around our home that received some party decorating as well. Favor bags of simple paper sacks and printed labels sat at the door to pass out as guests left. I choose to not clutter the dessert table with the extra Fairy Cakes and paper goods, but still thoughtfully displayed them on our kitchen island. Guest were greeted with a small display of nature from a cake dome full of pine cones and other dried naturals, a birds nest and flowers. For brunch we walked two blocks away to the cafe that inspired the Woodland theme. 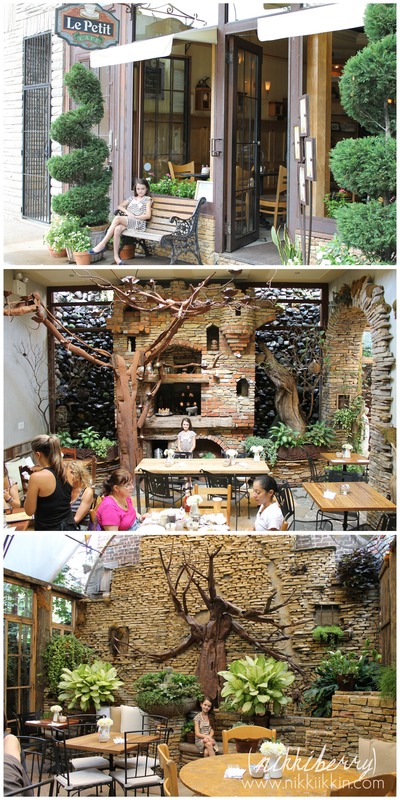 This cafe design is so amazing, I cant believe that it is only two blocks from our home, it looks like it was imported from Disney World. I padded the party time an extra hour to work in the walk and wait for our table. To make ordering easier on us and our server I gave the girls the choose of 5 basic brunch items and wrote them on little menu cards before we headed to the cafe. The girls just showed the card to the server to place their order, genius right? 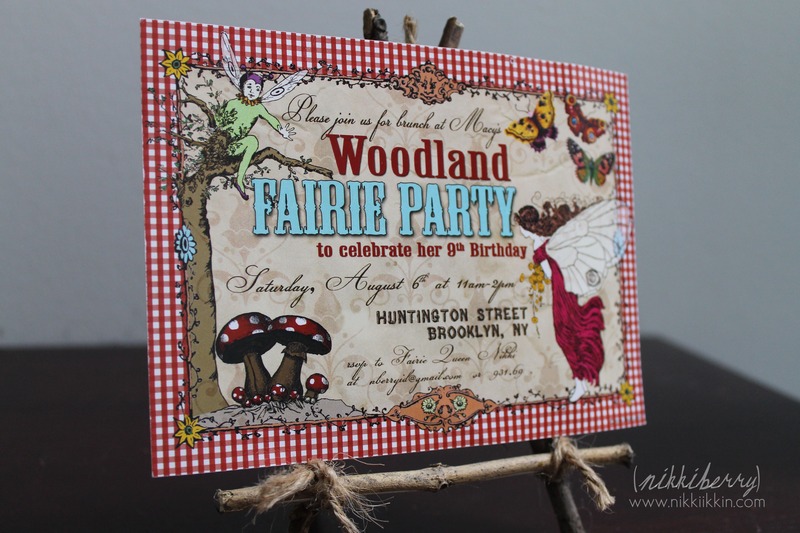 The menu card and welcome sign I designed were compliments to B. Nute productions Woodland Fairie tags. I found the stick boarder on a web site offering public domain images from old books called http://www.fromoldbooks.org. The Twig pencils were part of the favors the girls took home. Macy and I brainstormed the idea of a Treasure Hunt for lost things. Inspired by stories of Peter Pan and Tinkerbell, we came up with the idea of trinkets and magical fairy items to search for. My favorite item was the Rattle which represents “a baby’s first laugh”. From the story of Peter Pan, this is when a fairy is born! Gathering the items for the treasure hunt was a treasure hunt for me! It was a lot of fun to do and most of the items were found in craft stores. I used a border image from http://www.fromoldbooks.org again to design the sign and treasure hunt card that complimented our other party decorations. 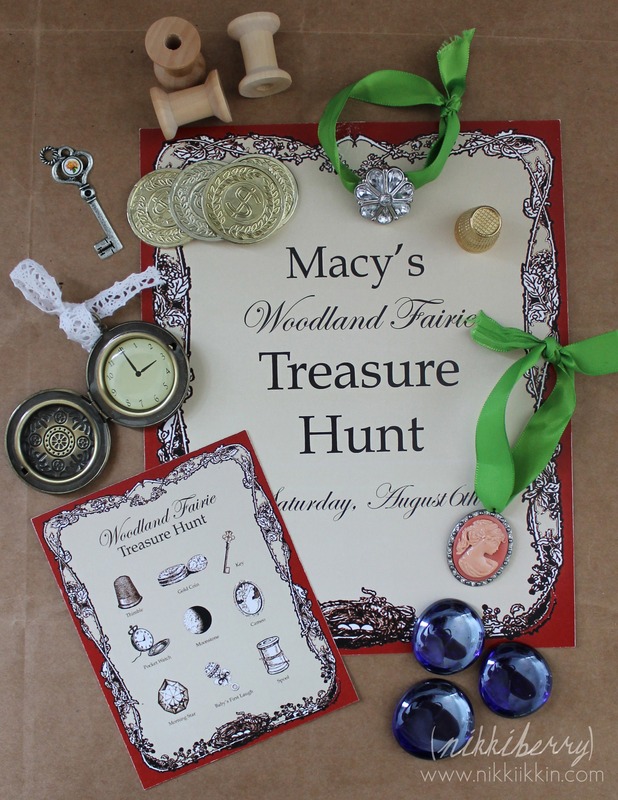 The images on the treasure hunt card came from http://www.graphicsfairy.blogspot.com, I love her images! The girls did a craft decorating fairie houses. Macy has made real fairie houses in the woods at camp with Girl Scouts. Those houses were made out of all natural materials like twigs and leaves. We pre-painted small birdhouses dark brown to give a natural material feel but I felt that the girls would have more fun if the decorations were sparkly. Now that Macy is 9, she helps out a lot with the preparation of her parties (she made all the toadstools on the cake!). She is a crafter like me and during one of our working days she sat beside me while I made the fabric bunting, turning my sewing scraps into fairy clothes, They were quite impressive! She also loves to share her opinion and ideas, for this party table she came up with the idea to place small sparkly pompoms hiding in the branches to represent our Woodland Fairies. Our fairies were shy but you can see one of them above tucked in the berries. 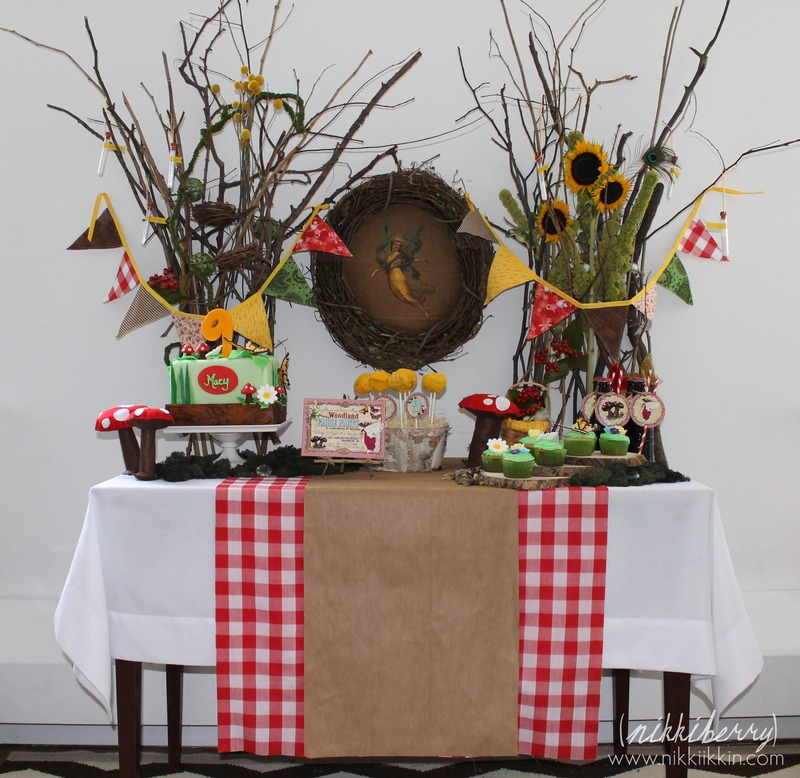 What gave this dessert table its woodland presence was the sticks and wreath on the wall. The Queen Fairy looks over the party with such grace! I also found her from Graphics Fairy and spray mounted her to the same kraft paper as the table runner. Tying it to a grapevine wreath made it look like a Woodland Portrait. Wondering how I got those sticks (that my wonderful husband gathered in Prospect Park for me) to hang on the wall? I have some great pictures of how I made that and the wreath hang that I will share in a Behind the Scenes of the Party post. I also made the felt toadstools for the dessert table and now sell them by the set on my Etsy Shop. I hope you have enjoyed my daughters party pictures! I have designed her parties for 9 years and my son’s for 1 year, as well as a few years of my nieces parties. 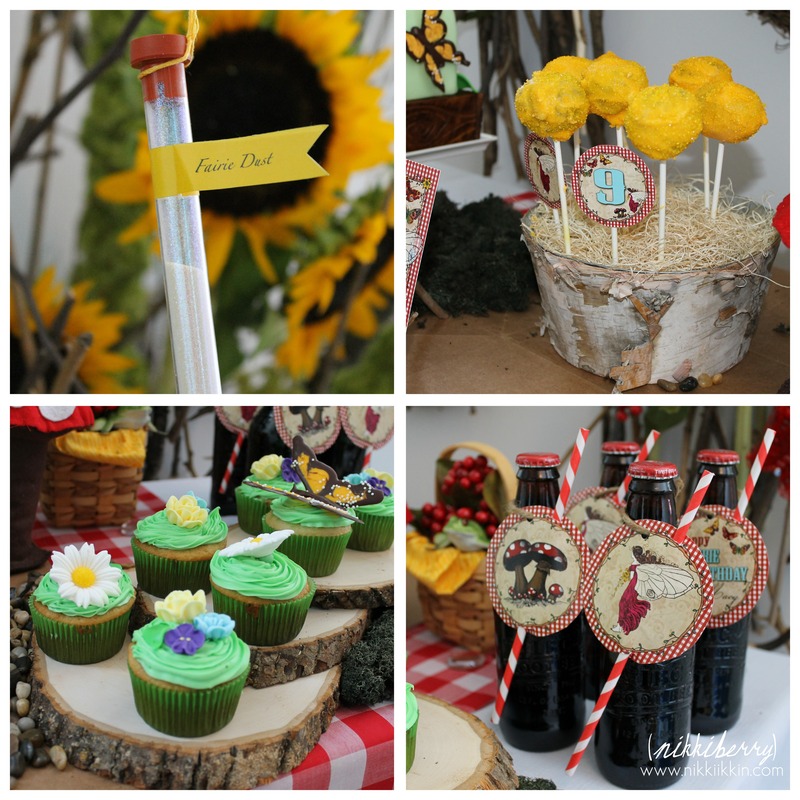 I am slowly getting all of my previous parties into blog posts, so be sure to check back often to see whats new!